Looking for a way to safely clean your granite or stone countertop? Bar Keepers Friend Granite & Stone Cleaner & Polish is formulated specifically to clean and polish stone without damaging delicate surfaces. Use on smooth, polished stone surfaces including granite, marble, and quartz to clean and enhance the beauty of your natural stone surfaces in one step. 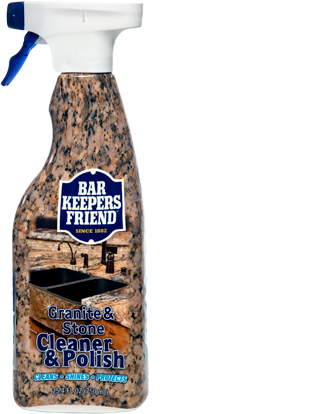 Bar Keepers Friend Granite & Stone Cleaner & Polish is a safe alternative to harsh spray cleaners, bleach, and abrasive cleansers. Keep your countertops looking brand-new with BKF’s new product for granite and stone surfaces. What’s the best way to clean granite and stone? Granite’s durability makes it a popular choice for kitchen countertops, but while it can withstand a lot of abuse, it doesn’t tolerate acidic or alkaline cleaners well. Vinegar, glass cleaners that contain citric acid or vinegar, and some disinfectants or degreasers can cause etching – dull spots where the cleaner has penetrated the granite’s porous surface. Other types of stone countertops, such as marble, are even more susceptible to etching. To remove food deposits, light greases, and grime, you need Bar Keepers Friend Granite & Stone Cleaner & Polish. Our special pH-balanced formula removes grime and some stains without the use of harmful chemicals, and it’s safe enough to use every day. How do I use Bar Keepers Friend Granite & Stone Cleaner & Polish? Routine cleaning: Spray directly onto surface. Wipe clean using a soft, clean dry cloth or paper towel wiping in a circular motion. Soft, clean microfiber cloths work well, too. Heavier soils/greasy areas: Spray cleaner onto surface. Let stand about 1 minute. Rub surface lightly with a non-abrasive, nylon-mesh sponge or microfiber towel. Wipe the surface dry with a clean, soft cloth, paper towel, or microfiber cloth. Use Bar Keepers Friend Granite & Stone Cleaner & Polish on stone, granite, and marble countertops, vanities, polished stone fireplace surrounds, and sealed stone lawn ornaments. Is BKF Granite & Stone Cleaner & Polish safe to use on all types of stone? Although this product is formulated to clean granite and stone, always test in a small, inconspicuous area first. This product is not recommended for butcher blocks, painted or lacquered surfaces, brick, slate, or grout. Do not mix Bar Keepers Friend Granite & Stone Cleaner & Polish with other household cleaning products. After use, turn spray nozzle to “off” and store in a secure location. Natural stone countertops are porous, and regular cleaning removes grease and grime before it settles in permanently. Safely remove superficial oil stains, coffee stains, and food soils and debris with Bar Keepers Friend Granite & Stone Cleaner & Polish. Do not swallow. Do not get in eyes. Keep out of reach of children. Bar Keepers Friend is recommended by some of today's most trusted brands. All-Clad, Pella, Kohler, and more suggest BKF for everyday cleaning and the toughest stains.